Alberta’s capital city is always celebrating something, from arts and culture to food and wine, dragon boats, winter and even accordions. You have more than 60 festivals to choose from, year round. Plan to spend the better part of a day – or longer – at West Edmonton Mall, which is the largest shopping and entertainment complex in North America and the size of a small city. 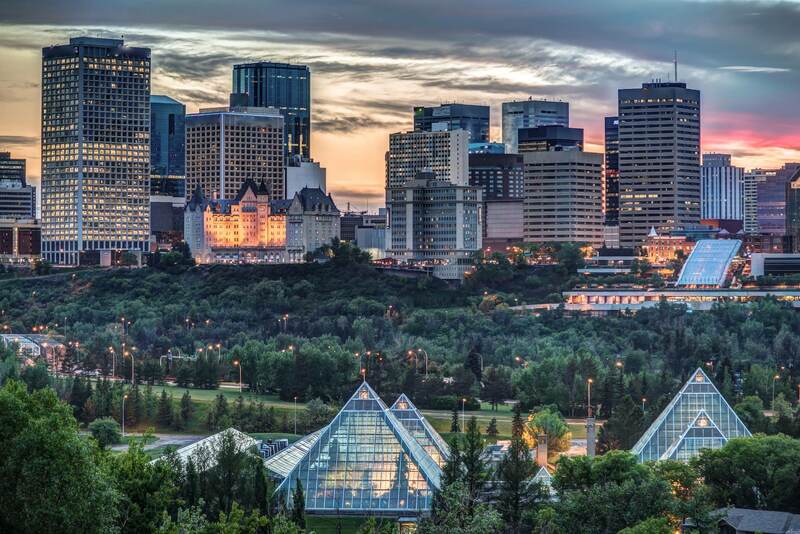 Explore Edmonton’s museums and historic sites. Come to the famous farmers’ market in the Old Strathcona and visit with local vendors. Explore the galleries and shops, find a funky restaurant and stick around for the night life – live theatre, music and dancing. Edmonton has a humid continental climate. The city has milder winters than either Regina or Winnipeg, both further south of Edmonton in latitude. Its average daily temperatures range from a low of −10.4 °C (13.3 °F) in January to a summer peak of 17.7 °C (63.9 °F) in July. With average maximum of 23.1 °C (73.6 °F) in July, and minimum of −14.8 °C (5.4 °F) in January. Annually, temperatures can exceed 30 °C (86 °F) for an average of four to five days anytime from late April to mid-September and fall below −20 °C (−4 °F) for an average of 28 days. The highest temperature recorded within the City of Edmonton was 37.2 °C (99.0 °F), on June 29, 1937. On July 2, 2013, a record high humidex of 43 was recorded, due to an unusually humid day with a temperature of 33.9 °C (93.0 °F) and a record high dew point of 23 °C (73.4 °F). The lowest overall temperature ever recorded in Edmonton was −49.4 °C (−56.9 °F), on January 19 and 21, 1886. On January 26, 1972, the temperature was recorded at −48.3 °C (−54.9 °F) and at -61 with the wind chill, making it the lowest temperature including the wind chill ever recorded in Edmonton. Typically, summer lasts from late June until early September, and the humidity is seldom uncomfortably high. Winter lasts from November to March, and varies greatly in length and severity. Spring and autumn are both short and highly variable. Edmonton's growing season is from May 9 to September 22. Edmonton averages 135-140 frost free days a year. At the summer solstice, Edmonton receives seventeen hours and three minutes of daylight, with an hour and forty-six minutes of civil twilight. On average Edmonton receives 2,299 hours of bright sunshine per year and is one of Canada's sunniest cities. Edmonton has a fairly dry climate. On average, it receives 476.9 millimetres (18.78 in) of precipitation, of which 365.7 millimetres (14.40 in) is rain and 111.2 millimetres (4.38 in) is the melt from 123.5 centimetres (48.6 in) of snowfall per annum. Precipitation is heaviest in the late spring, summer, and early autumn. The wettest month is July, while the driest months are February, March, October, and November. In July, the mean precipitation is 91.7 mm (3.61 in). Dry spells are not uncommon and may occur at any time of the year. Extremes do occur, such as the 114 mm (4.49 in) of rainfall that fell on July 31, 1953. Summer thunderstorms can be frequent and occasionally severe enough to produce large hail, damaging winds, funnel clouds, and occasionally tornadoes. Twelve tornadoes had been recorded in Edmonton between 1890 and 1989, and eight since 1990. A F4 tornado that struck Edmonton on July 31, 1987, killing 27, was unusual in many respects, including severity, duration, damage, and casualties. It is commonly referred to as Black Friday due both to its aberrant characteristics and the emotional shock it generated. Then-mayor Laurence Decore cited the community's response to the tornado as evidence that Edmonton was a "city of champions," which later became an unofficial slogan of the city.